A new author I heart – Neil Gaiman. Spent my weekend RIVETED by this book. Yes, it's aimed at young people aged 9 – 12, but wasn't it the same for Harry Potter? And, speaking of, The Graveyard Book is, in some ways, Harry Potter condensed. And I know there are only so many plots, not to mention conventions in fiction. Orphans, dangerous sorts out to hurt said child, protective guardians… All are common. But in this book who cares? It's seriously fantastic. 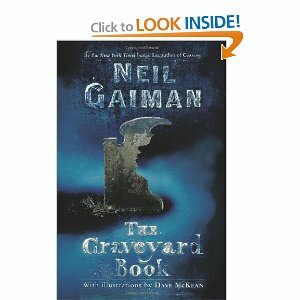 After the rest of his family is brutally murdered (Gaiman is fond of his violence, though it's never terribly graphic – no pun intended), a nameless toddler climbs out of his crib and roams the streets, finding his way into a graveyard. Several ghosts find him, marveling that a child so young should be out in the middle of the night. Them comes the murderer, intent on killing this last member of a dangerous (to him and his people) family. The ghosts band together to protect the child, whom they wind up raising until he becomes a teenager. The imagination in this book! The fascinating tales each ghost has to tell, the magic they share with him, the friends he makes… You have to read it to fully experience it. I was so absorbed I couldn't put the thing down. I even walked around the house carrying it, unable to put the darn thing down. I haven't been this completely transported for a long, long time. If any of these themes appeal to you, do check out this book. Never mind the target age; if you're like me you'll find it unputdownable (is that really a word – ah, who cares). And you can thank me later (chocolate and gift cards accepted). I’m always amazed anyone connects this to Harry Potter. I suppose there are the obvious connections, as you pointed out (orphaned boy, protective guardians), but to me, it reads as pure Jungle Book, which I believe is what Mr. Gaiman based it on. If you’re looking for more titles by him, his comic book series SANDMAND is fantastic. Also great: GOOD OMENS (with Terry Pratchett), AMERICAN GODS, STARDUST, and CORALINE. And pretty much everything else he’s written, of course! I must give this a look. I didn’t mind Coraline, but could not get into American Gods (which my brother-in-law just worships). Cassie, I haven’t read The Jungle Book, and yes I think you’re right about Gaiman basing his book on that. All Gaiman’s works are on my To Be Read list, and the sooner the better! Squeee! So glad you liked this one as much as I did. I’ve even re-read it! That never happens. “Danse Macabre” was my favorite chapter. Just beautiful. Andi, I feel let down now, wondering what I can read next that’s in this same genre and as good as this one. Wish I could read it again for the first time!